Centre for Entrepreneurship Development (CED), in collaboration with Fair and Lovely Foundation of Unilever Bangladesh Limited, has organized two (2) 2-day long workshops on Beauty Parlor Management for the BRACâ€™s adolescent girls during September 14-15, 2015 and September 21-22, 2015 at BRAC University Auditorium and BRAC DevPro respectively. These girls have been trained under the adolescent program which provided life skills training to the rural adolescent girls and young women between the ages of 14 and 15. 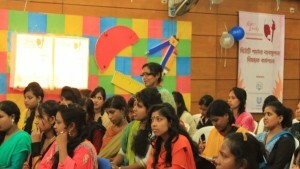 The workshop aimed to provide these girls with skill development training on â€œbeauty careâ€. After receiving this training, these girls would start working at beauty parlors. CED took this opportunity to help these adolescent girls and young women so that they know how to operate a beauty parlor profitably.